Lisa spinning on her 80's era Louet spinning wheel. There are probably web sites out there that could tell you a great deal about spinning wool. In case you are unfamiliar with the craft, and, in modern times this is largely the case, I will impart my limited experience here. Although I have spent countless hours at my wheel, I am not formally trained in spinning. 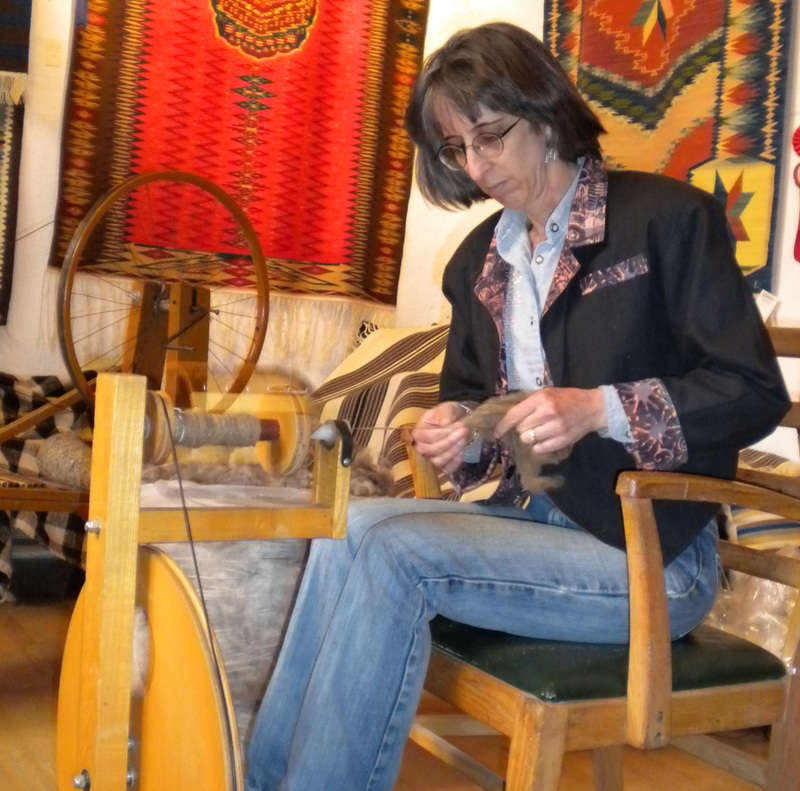 I currently spin at a Shacht Ladybug spinning wheel, and never ply my handspun. I am able to spin different thicknesses of wool, although a very thick yarn is difficult for me at this stage. Most often I have spun directly from unscoured wool. This is commonly called "spinning in the grease". I have been warned about this, as sheep can carry disease, and I have to admit that there is a certain, occasionally unpleasant, smell involved. And it is true that I can spin a more even yarn if I scour and card the wool first. But years of practice, combined with a practical level of laziness, has led me to this as my favorite process. What follows here is a summary of a traditional process for preparing wool. Skirting a fleece is the first step after shearing. (I've never kept sheep, nor sheared them.) It involves removing the unspinnable stuff. That is, wool that is too short, too greasy, or covered with other materials that sheep manage to get into their wool. Scouring the wool is basically just as it sounds. First the wool goes into a vat which has a convenient hole on the bottom. We then cover the wool with water several times, letting the dirty water drain out the hole. Then we do a detergent wash, with warm water, to remove the excess lanolin. Then we spread it out and let it dry. 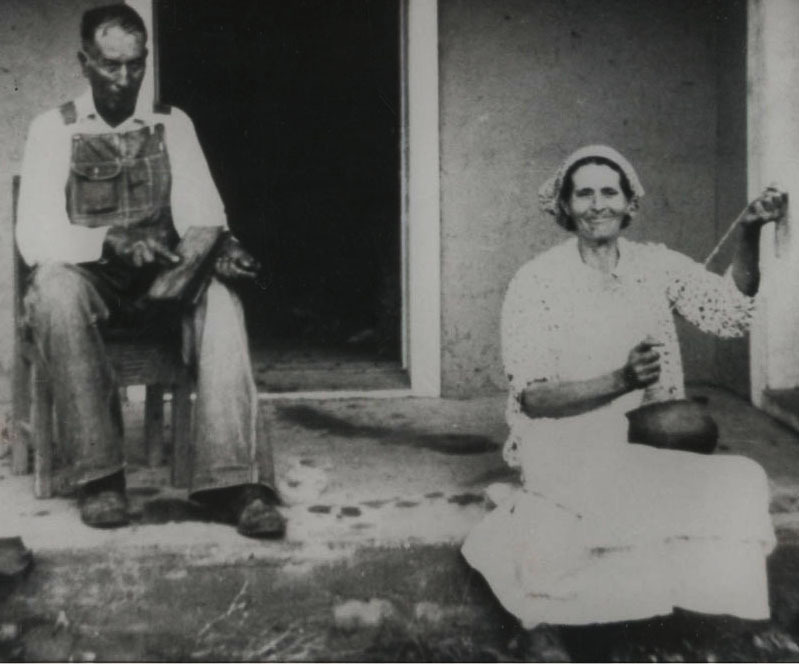 Carding wool, by means of hand cards or a drum carder, arranges the fibers so that they are evenly distributed through a rolag (for hand cards) or bat (in the case of a drum carder) and easy to spin. This produces a &quot;woolen&quot; yarn, light and fluffy, or as knitters might appreciate, it has &quot;loft&quot; to it. This is very suitable to blankets and clothing as it traps more air between skin and cold air. Combing wool, on the other hand, arranges fibers in a more parallel arrangement. This produces a &quot;worsted&quot; yarn when spun. This is a yarn more suitable for rugs. It's fibers are more tightly packed, and so less penetrable by dirt. This makes it hard wearing. It is also harder to break by merely pulling, so it makes a much better warp yarn. It is possible to comb wool, spin only the longest fibers to make a strong warp, and then card the shorter fibers for a weft yarn for a warm blanket. Churro wool is ideally suited for this due to its double coat. Once I have processed, or not processed, my fibers, as the case may be, I am prepared to spin the wool. The process of spinning involves drawing a reasonably consistent amount of fiber into a continuously twisting yarn. Actually it's not continuously twisting if I spin on a malacate. The malacate is the spindle traditionally used by spinners involved in producing Rio Grande blankets. It is roughly a foot long, usually has a wooden whorl, and is used with the spinner sitting down, with a bowl in their lap, and the malacate spinning in the bowl. Spindle spinning is a good way to get an understanding of the spinning process, but I prefer to use my wheel for actually producing yarn. I've been spinning since around 1985 and have done a lot of yarn. In recent years we have actually had a handful of orders for handspun pieces, including some pretty large rugs. This means that I have had to find a way to spin larger quantities of yarn than I ever did before. The answer to this was to buy a modern wheel. It seems silly to say that spinning wheel technology has improved a lot in the last three decades, but it's true. My new Ladybug wheel is just much easier to treadle. I also invested in what's called a "Woolee Winder", which allows me to spin without pausing to move yarn from hook to hook. The last component for production spinning was willpower. If I make myself sit down at the wheel every evening after dinner, I can get lots of yarn spun. One other thing about my spinning that I want to be clear about. I am spinning for weft-faced rugs and blankets. I want to produce a yarn that is going to be strong. I also want a yarn that shows that it is handspun. This means that I don't need soft, fluffy yarn, and I don't need it to be too even in texture. So I get to spin a yarn that other spinners might not really have any reason to admire. I still love spinning, and doing it the way that I do. It might be the most pleasant job I ever do in our business. It can be pretty mindless work, even when it's kind of challenging wool. Actually, maybe mindless is not the right word for it. Really it's a lot like "mindfulness" meditation, only with yarn as an end result.